This piece of original art is currently for sale. For more information please contact us. Indiana Jones and the Temple of Doom is a 1984 American action-adventure film directed by Steven Spielberg. It is the second installment in the Indiana Jones franchise after the financial success of the 1981 film Raiders of the Lost Ark, featuring Harrison Ford reprising his role as the title character. 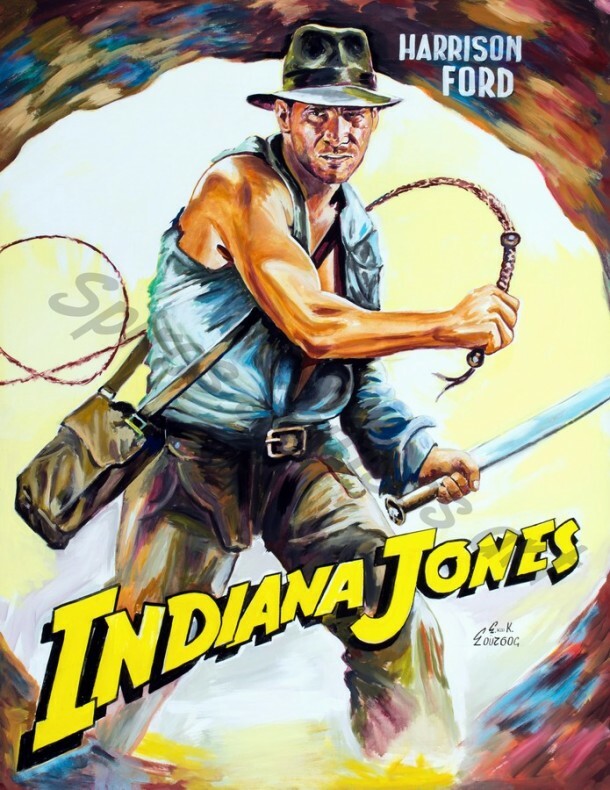 After arriving in North India, Indiana Jones is asked by desperate villagers to find a mystical stone and rescue their children from a Thuggee cult practicing child slavery, black magic, and ritual human sacrifice in honor of the goddess Kali. Producer and co-writer George Lucas decided to make the film a prequel as he did not want the Nazis to be the villains again. After three rejected plot devices, Lucas wrote a film treatment that resembled the film’s final storyline. Lawrence Kasdan, Lucas’s collaborator on Raiders, turned down the offer to write the script, and Willard Huyck and Gloria Katz were hired as his replacements, with the screenplay partly based upon the 1939 classic adventure film Gunga Din. Temple of Doom was released on May 23, 1984 in America, accumulating a record-breaking US$45.7 million in its first week. The film went on to gross $333.11 million worldwide, with $180 million in North America and the equivalent of $153.11 million in other markets. The film was released to financial success but mixed reviews, which criticized its violence, later contributing to the creation of the PG-13 rating. However, critical opinion has improved since 1984, citing the film’s intensity and imagination. Some of the film’s cast and crew, including Spielberg, retrospectively view the film in a negative light, partly due to the film being the most overtly violent Indiana Jones film. The film has also been the subject of controversy due to its portrayal of India and Hinduism.